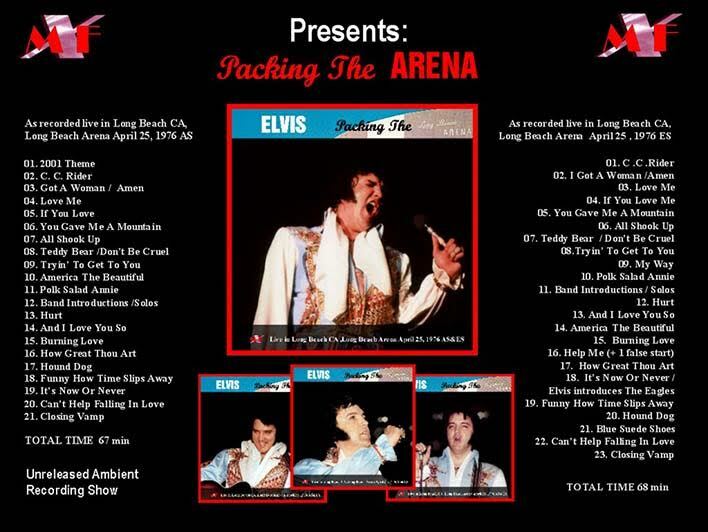 The MxF label will release soon its third special product called “Packing the Arena'' featuring both the shows performed from Elvis in Long Beach CA, Long Beach Arena on April 25, 1976. The 2.30 PM show is previously unreleased, while the 8.30 PM show has been previously released on CD ("California Wave” on Memory Records in 2009). However here is presented in very improved audio-quality so, We believe it is the right time for a proper re-release. After the successful Las Vegas Hilton comeback in December 1975, in spite a little bit overweight but with strong spirit, Elvis is ready to face his long tour activities of 1976 ….... The first tour started in the middle of March , a passable tour but nothing more..the man obviously is afflicted from a lot of problems …personal relationship, recording session and overall self-attitude destructive to life …. everything seems to go wrong . This is the third special Product for this label, this new double set will be housed in a deluxe 20 CM digipack, containing a 12 pages of booklet with focus and details on the tour shows, including a collection of live photographs, newspapers clips and memorabilia plus a high quality glossy 135 gram paper poster of 40x40 cm size + an high glossy quality paper art card ( 20x20 cm). until the SA is out. Both shows are worthwhile to have for collectors in any case. No matter how you decide.